Our former office is in the process of being transformed into a playroom for our little spirited kiddo. I knew I wanted to recreate the IKEA expedit-turned-benches seating in Jen's playroom since we are super limited on space. The only problem? Our closest IKEA is a cool 5 hours away. Bummer sauce. BUT, never fear when you have THE most talented father-in-law in all the land who can make anything in the world. I showed him what I wanted, and we customized the height, depth, and length to fit perfectly in our room. 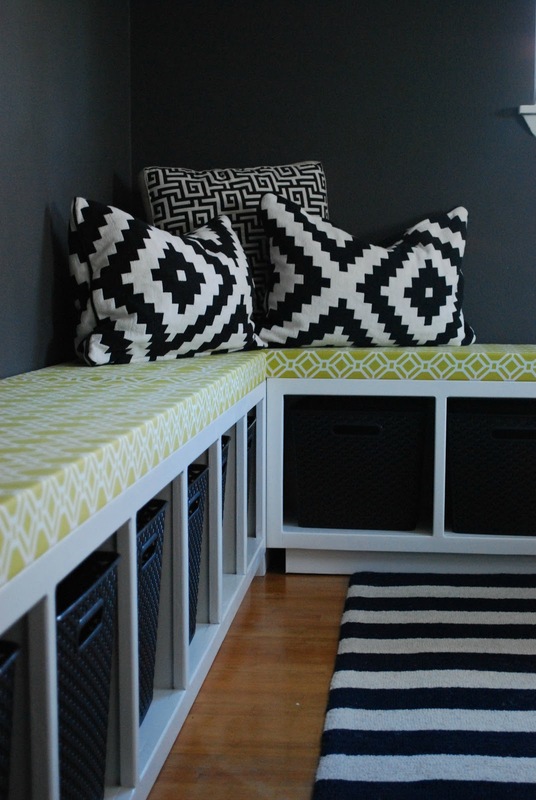 And within a few weeks time, thanks to Grandpa Dan, Ther-bear had two custom benches just waiting to be upholstered. I decided on this fabric to bring some color into an otherwise very dark room. 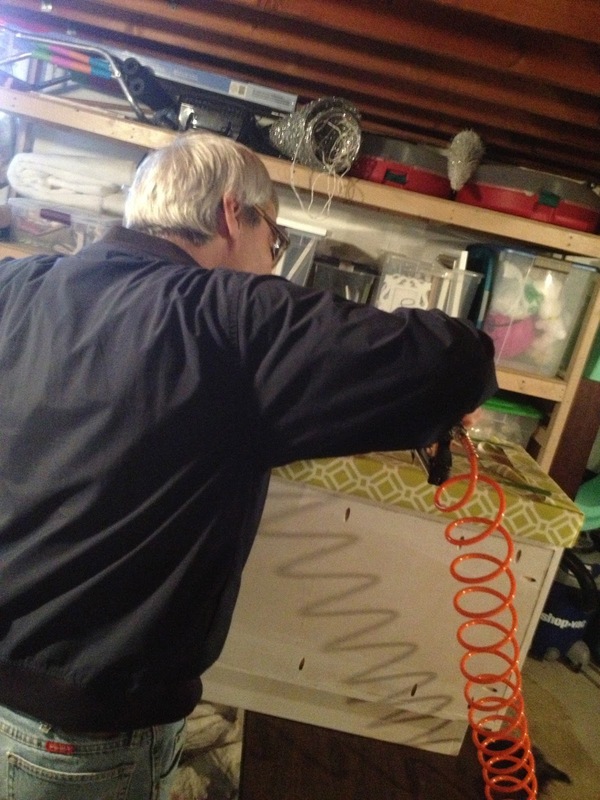 This weekend Dan brought up his fancy air compressor staple gun and basically upholstered both benches on his own. I helped just a smidge. 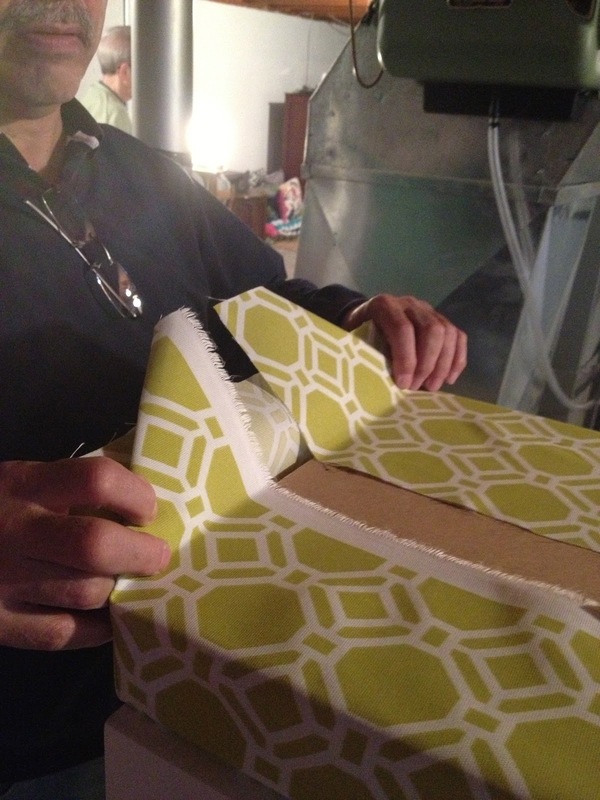 Dan's quite the perfectionist and vetoed my method of "christmas present" upholstery ends. He took the lead on the ends and made them look really finished. He's the best. 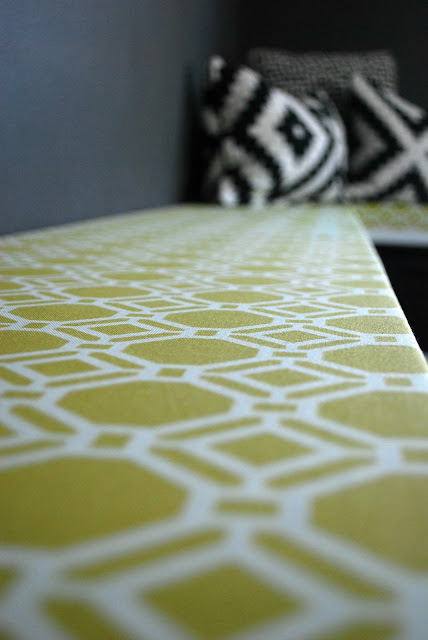 I used Jen's suggestions of 2" foam from JoAnn Fabrics and MDF cut down to size from the Hardware Store. The foam was pricey, and I've heard of other people going to hardware stores and buying boat foam and cutting it down to size. Just a thought! We've still got a lot to do to pull this room together but it's come a long way in just a few days! At first glance I would have assumed these were the Expedit (which I always love). They turned out amazing, and I love how all the graphic patterns and colors work together. p.s. also love: your current blog look! So great. Joi - this looks SO good. Gosh. 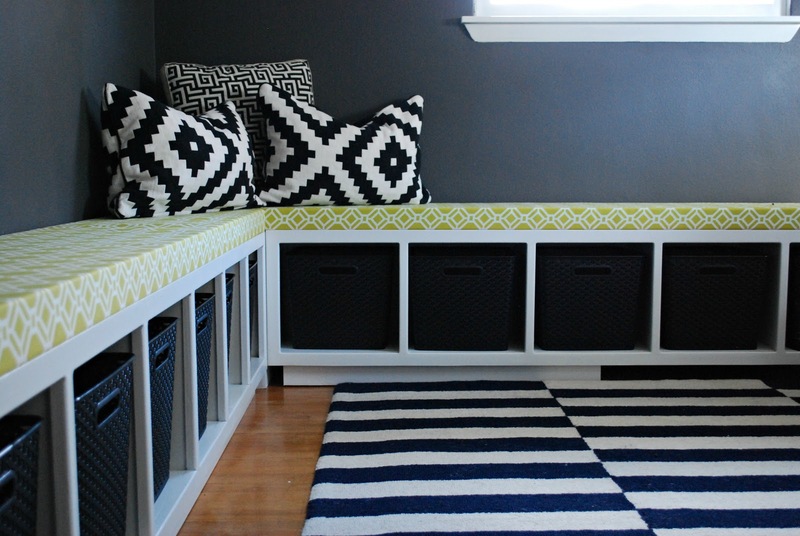 I love the upholstry fabric and finish and all that storage is totally dreamy. Also, this is so much better than IKEA's version - just the right size, better quality, and personally made by someone so special. Can't wait to see the rest of this room come together. Love, love, loooooove! I've been trying to figure out some cute storage ideas now that we're having to combine our second living/play room due to our new addition. This might work perfectly. And, looking at these pics again makes me want to cry that I missed out on snagging those curtains! Gorg. 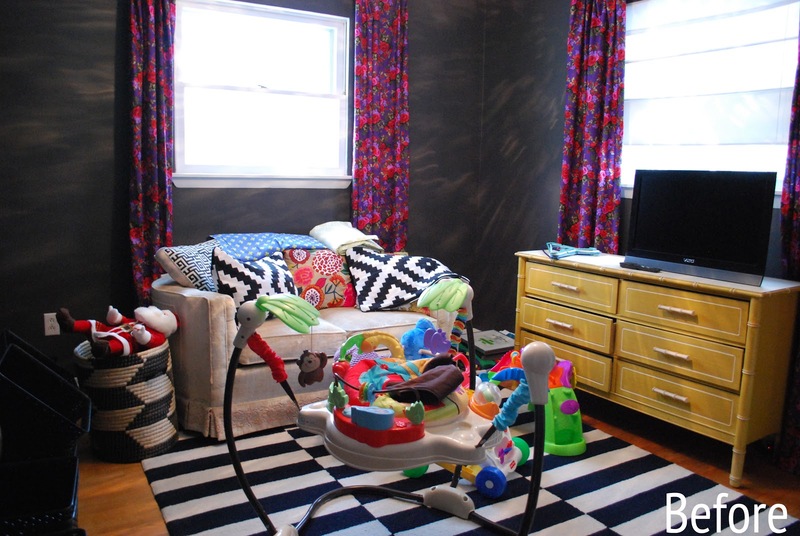 I LOVE this glimpse of T's playroom & can't wait to see more! He's one lucky baby to have such loving parents! They turned out great! I'm loving the mix of black and yellow patterns together. T is going to have such a stylish playroom! oooh... those turned out well! Looking good! Can't wait to see the rest when you finish! I just posted about some kiddie art work if you're looking for ideas! Love it! I chose the exact fabric for my kitchen curtains but in sunshine. What do you have in the corner? Is that an open space that pillows hide or do you have bench in that area too? Where did you get the totes? What are their sizes? How big is each cube area? How big are the cubes? Where did you find large storage totes? Name and store? This is perfect! I love everthing about them. You're so crafty! What are the dimensions of your benches? and how did you deal with the extra space in the corners where they don't connect? I'm trying to build something similar for a breakfast nook.